I have finally had some time to go through some fashion plates and get some inspiration for the gown that Chantelle will be wearing. Chantelle has since received the beginnings of her undergarments. The fashion plate pictured is just for reference. 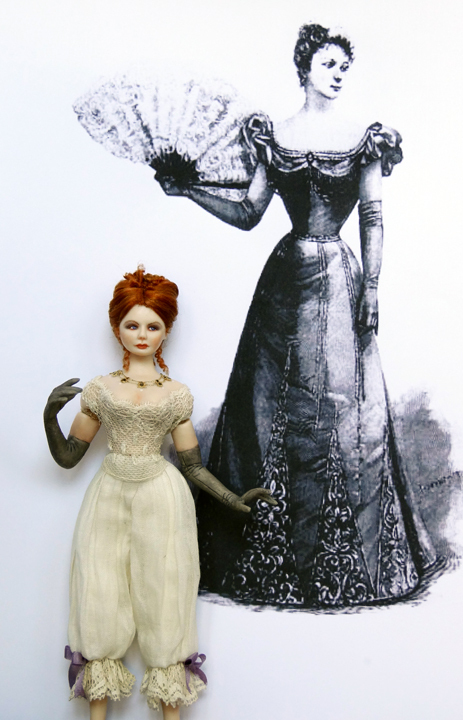 The gown will be similar but not a miniature copy as I have some other ideas and elements I want to add. 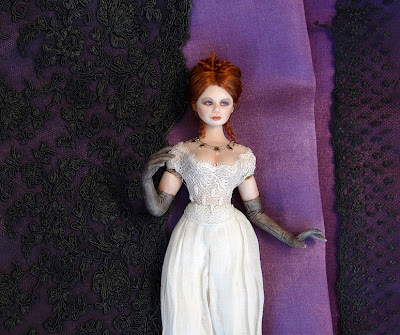 I also have a great pieces of antique lace that I want to incorporate into the skirt as an overlay. 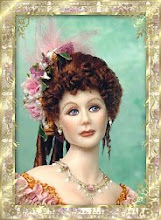 I found this great fashion plate online and was thrilled to see how much it sort of resembles Chantelle, her gloves, etc. 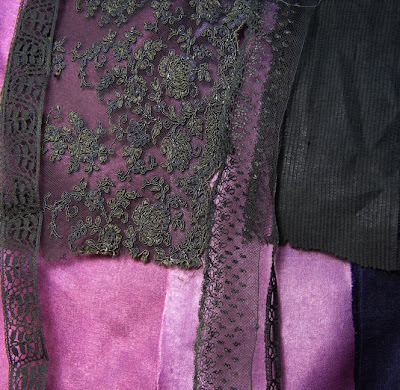 I have decided on a nice color palette of rich lilac & purple and dark charcoal laces. 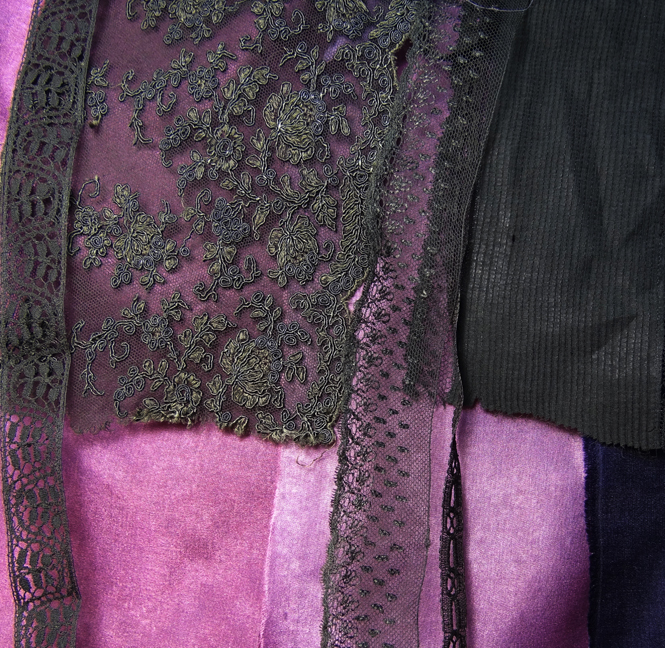 I went through all of my antique lace & trims and pulled the ones I think will work for the idea I have in my head. Since all of the lace and trims are ivory colored I had to dye them a deep dark charcoal color. They will read as black in such a small scale which is what I want. I used Tulip fabric dye to color the laces. I added a bit of brown to the black to warm the color up a bit. I especially love the dark charcoal tuck pleated fabric on the right. It is originally from the lower edge of an antique pair of pantaloons. The pleats are only about 1/16" wide. So fine. It still has the tiny cotton lace edge attached to the bottom. This dye will NOT work on cotton fabrics which is why I used Tulip Fabric Dye for the cotton lace & trims. Stay tuned for the next installment of Chantelle! This is sooooo interesting Gina. Thank you for taking us on this journey with you!!! I would like to try the fabric dyes. 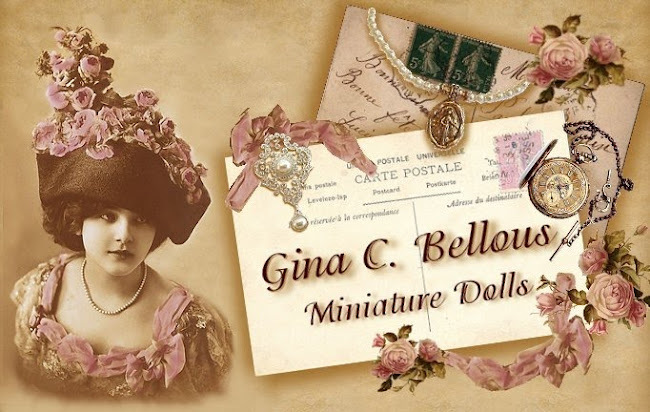 I love the laces along with the fabric colors that you have chosen. She's going to be wonderful. I can hardly wait for your next post.